Karachi: March 2, 2011. 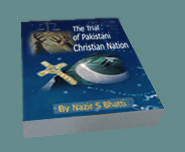 (PCP) Dr. Nazir S Bhatti, President of Pakistan Christian Congress PCC have strongly condemned broad daylight assassination of Federal Minority Minister Shahbaz Bhatti in capital city of Pakistan. Nazir Bhatti said that we have also appealed government of Pakistan to add more security personal in security squad provided to Federal Minister for Minorities Shahbaz Bhatti when all other ministers move in covey of five pickets but Shahbaz Bhatti moves with only two pickets but government not paid any attentions on PCC frequent requests. Nazir Bhatti said that Shahbaz Bhatti is our martyr and will be ever remembered as martyr of Blasphemy law and we will keep on campaign for repeal of blasphemy law.